i wanna hold them like they do in texas please. A line from one of my favourite songs at the moment. i think pokerface. sounds like poke HER face. anyways, yes i'm back from my 3 day trip away. which was lovely. and at the moment i'm just looking at a few collections from london fashion week, which started on the 20th and end in just 3 days. i was looking at fall 09 backstage photos. and there really nice. really like this image for the colours, the colours are really stunning. 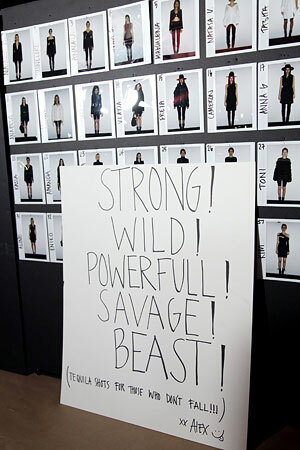 alexander wang backstage : i like this photo for a strange reason, especially what he's put as advice to the models. alexander wang backstage: AHHHH ZOE KRAVITZ!! i really love her hair and style and this picture is her on valentines day. at alexanders show. miss sixty frontrow: mischa barton and coco rocha look stunning they really do. 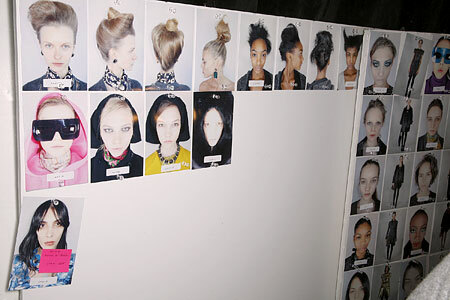 marc jacobs backstage: i really love the hairstyles. very unique indeed. I absolutely LOVE Zoe Kravitz style (and hair!) - theres a photo of her at the Erin Fetherston show in a gorgeous floral dress and a headband - she looks amazingg!!!! and I love the alexander wang sign too haha! aw thank you very much honey! and omg, my hair is a mess! its in desperate need of a good cutting haha! all I do these days is scrunch it with moose and let if flow! but thanks anyway, lovely! i have tons too!!! i try to read them once in a while!